If you can't buy the city council, create a new city. Many of those same decks would gladly run Archer, after all, it's cheap, brutally effective, and they have cheap agendas to spare! For the same influence (or lack thereof), they now have Corporate Town - the card that ends their woes against Film Critic, with the ability to cripple decks even if Film Critic isn't a target. When it's good, it's very good. Worst case, you lay it out alone face down and force them to decide if it's worth the 5 to trash, after spending a click to run it. Best case, you ruin their entire game plan, taking out Film Critic, a loaded Kati Jones, stacked Off-Campus Apartment, Tri-maf Contact for meat damage (maybe even a kill! ), stacked Personal Workshop, Aesop's Pawnshop that's literally their econ engine, Wyldside draw engine, Daily Casts before they take any credits, loaded The Supplier, make them use Hades Shard, or Utopia Shard, Liberated Account, Professional Contacts... Kill them all. Film Critic was the tipping point; Corporate Town is now essential in the right deck. And if you're NBN, you can run License Acquisition to install+rez it for free (even from Archives! ), but then they get a turn to take it down before it has its effect. Do note, NBN can also run Character Assassination, or Breaking News + trash from tag. In a meta full of resource-based economy (Security Testing, Symmetrical Visage, Kati Jones, etc. ), this is indeed a powerful asset for the corp. At the beginning of your turn, trash any resource the runner has installed. Loaded up Kati? Earthrise? It's dead. But the additional cost... is so steep. Is it worth trashing a Hostile Takeover to trash any resource? It can be a hard decision to make. I admit that I was incredibly skeptical about this card. Sure, trashing resources for free once a turn is nice, but sacrificing an agenda for it? That seems too high. Until I found ninj7's Exclusivity NBN Glacier deck build and my whole perspective changed. In the build, ninj7 uses License Acquisition to function as a sort of Eliza's Toybox, allowing you to install and rez Corporate Town for free. Using this card in a glacier deck ensures that you're nearly guaranteed to pop at least one of their resources. 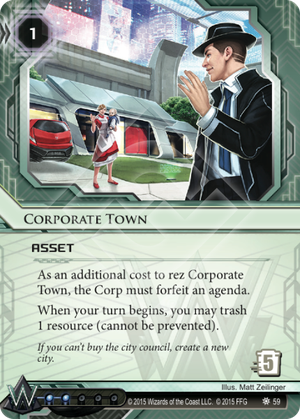 In this case, my normal playstyle with this card includes installing License Acquisition behind some kind of hard ETR like Little Engine or Tollbooth, scoring it, and then installing Corporate Town in that same server, either from hand or archives. Now the server, which they already couldn't get into because of the ice in front of it, becomes even more dangerous because the runner can't install resources until this asset is trashed. If it's installed behind a Tollbooth, the runner will need at least 9 credits in order to trash this asset, and the runner can't use resources to get those credits. Brutal. I imagine there are other types of builds that will use this card. Many glacier builds utilizing 1-point agendas (or other kinds of tricks) can punish a runner. --This card is like Archer: in the right deck, incredibly destructive by prohibiting runner's momentum. For other decks, it'll be significantly less useful.